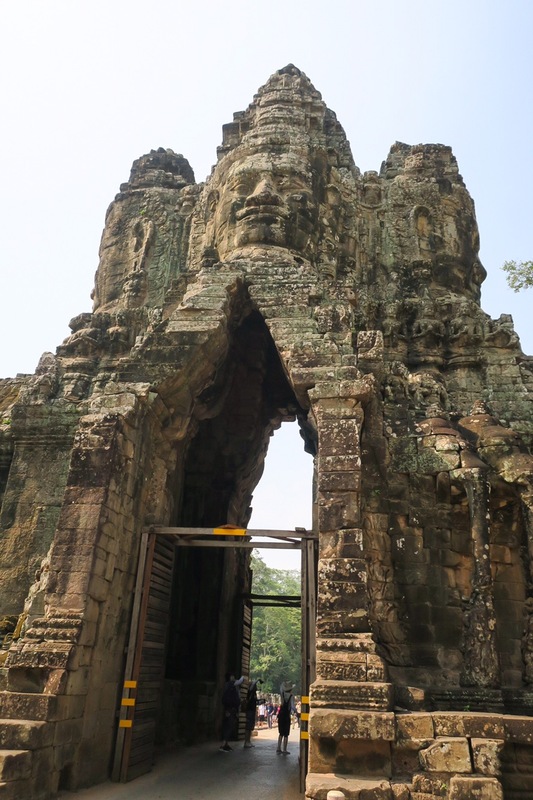 Cambodia has completely surprised us. We thought it was going to be super 3rd world. 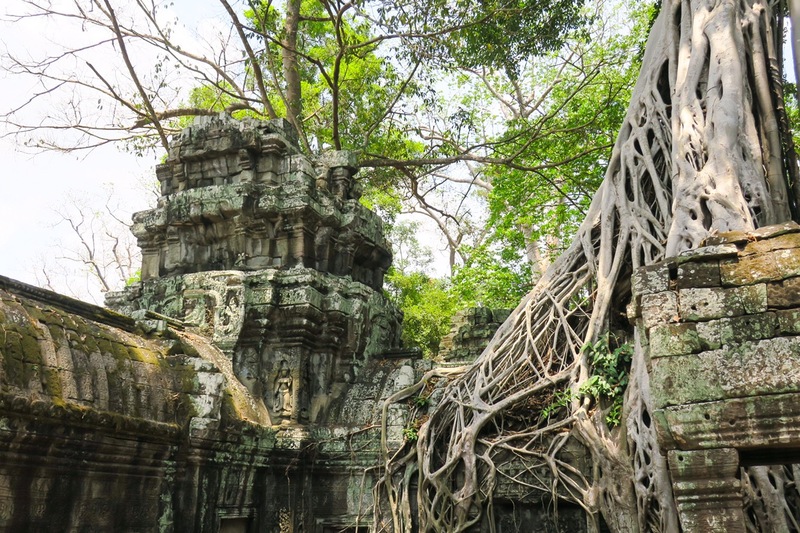 Old cars, run down roads and tiny shops… nothing more than the famous Angkor Wat. Boy were we wrong and we’re incredibly happy about it! First impression, the airport is gorgeous! Big, modern and clean! We expected something similar to Yogyakarta, small with only 2 baggage claim belts and nothing more. This was probably 5 times the size! While you can get your visa on arrival here, you can opt to do it ahead of time online. It costs a few dollars more, but you can pay with credit card (at the airport you can only pay in USD cash). We decided to go that route and once we saw the huge “visa on arrival” line, we knew we made the right choice. 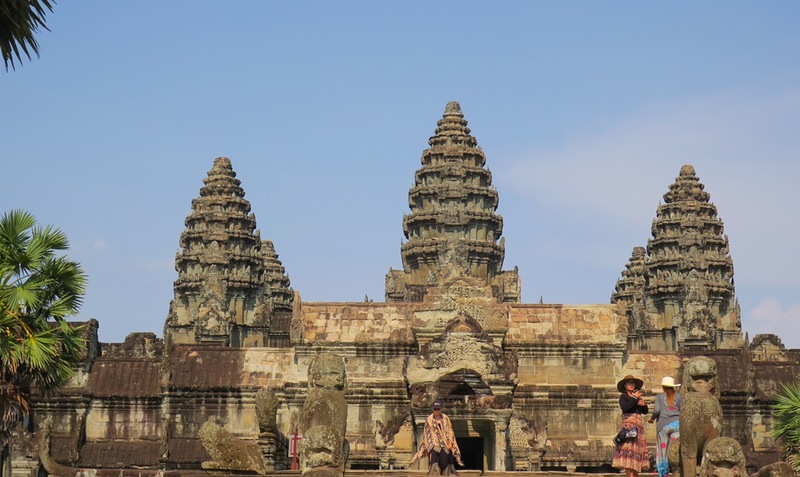 We went straight to the immigration line, showed our visa to the ever friendly Khmer immigration officer and hello Cambodia! 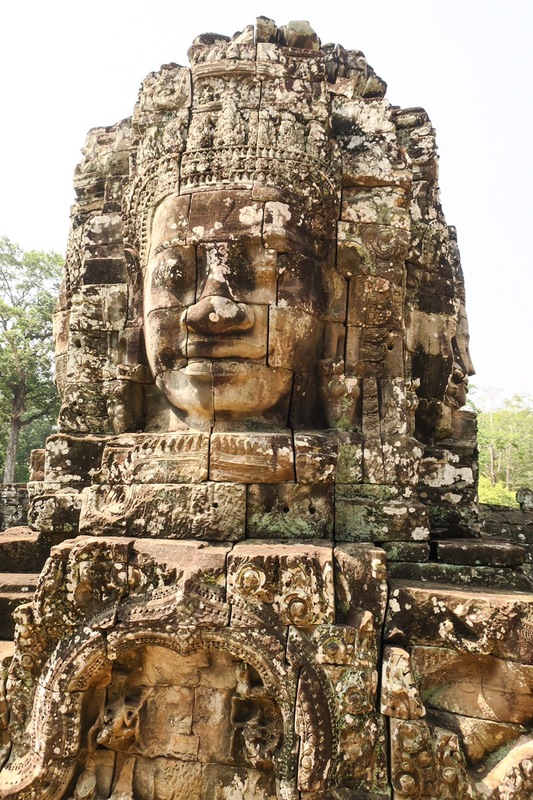 The drive from the airport into Siem Reap City took about 15 minutes and our hotel, The Prince d’Angkor had a free round trip airport transfer, score! 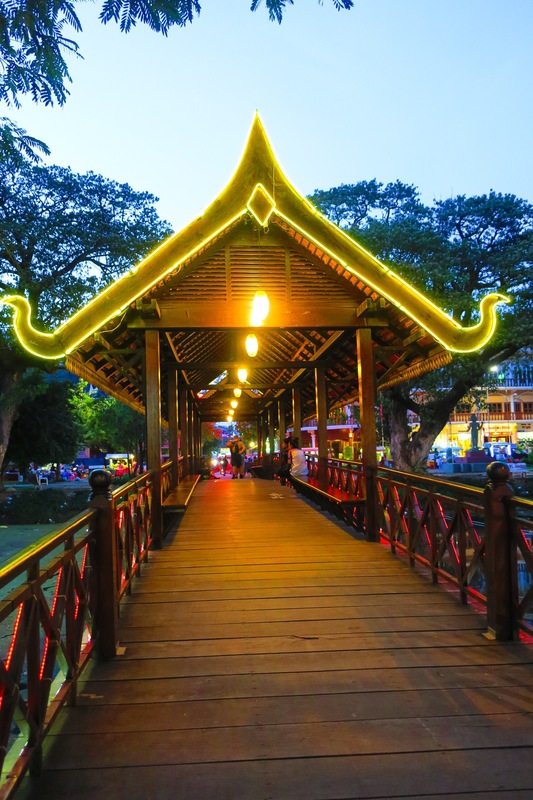 The “city” was similar in size to Chiang Mai, Thailand or Mendoza, Argentina… not a bustling city with tall buildings, but more like a densely populated town. 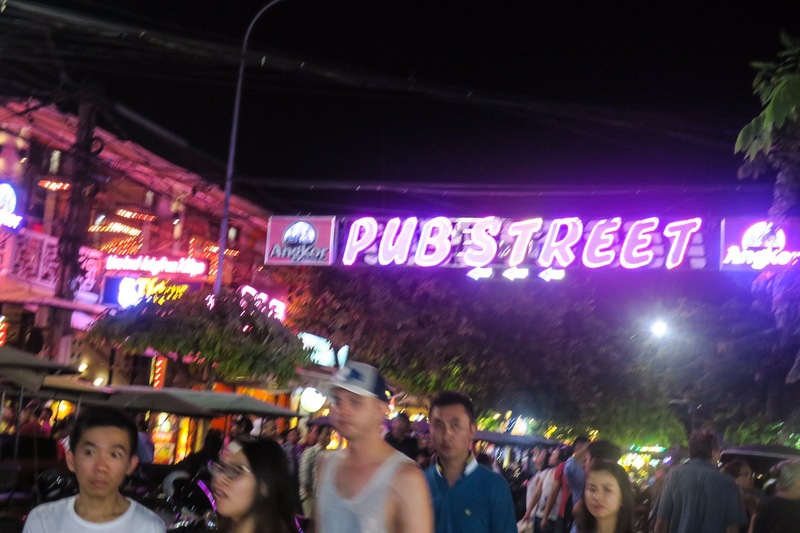 It’s clear that this town is based off of tourism, but also like Chiang Mai or Mendoza it doesn’t feel overly touristy. 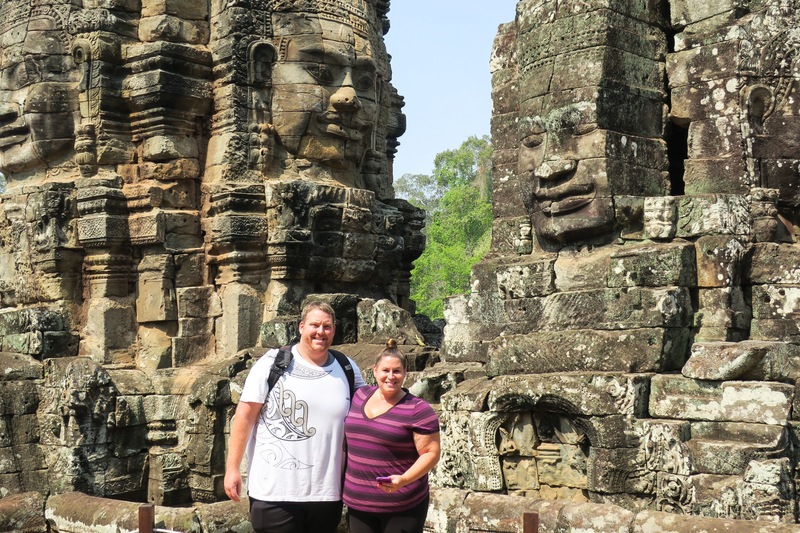 Aside from the fact that everything is in US dollars… that shocked us too! 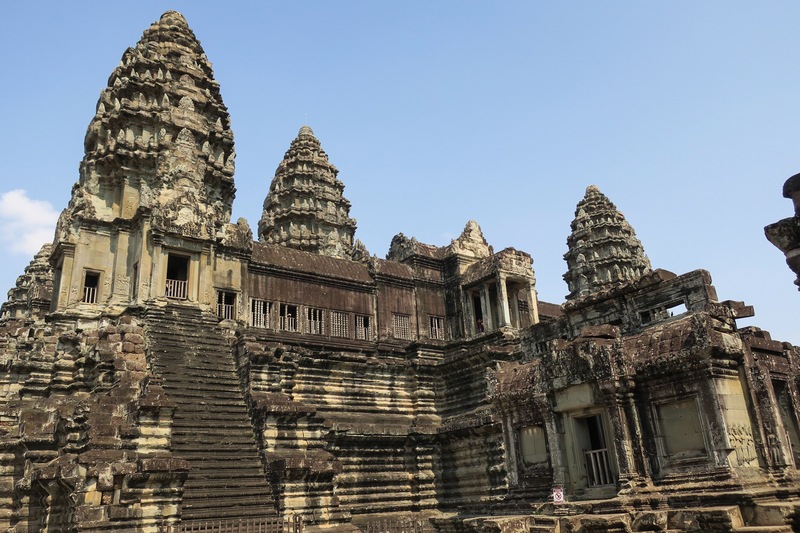 The main reason that people come here is to see the world famous temple, Angkor Wat and the other temples surrounding it. 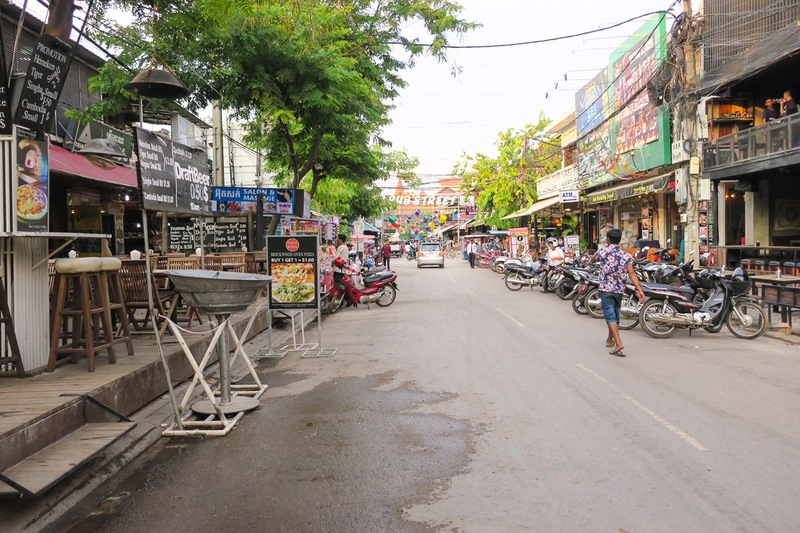 The streets of Siem Reap are lined with tour companies, very much similar to how Cusco was in Peru. Needless to say, one of the first things we did when we got here was check everything out and see what would be the best tour for us. There were different kinds, some including lunch, some in a private car, some in groups. 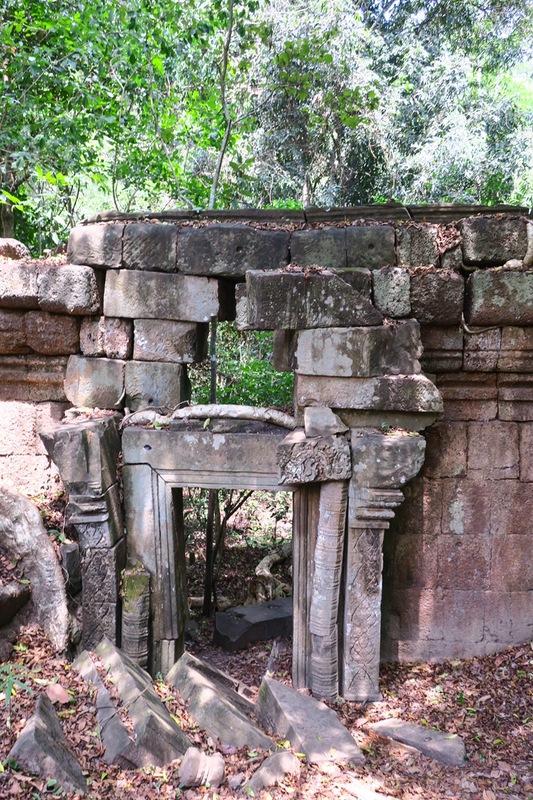 There were different “temple circuits” as well. A package that included a few temples but not the main ones and others that had only the main ones. 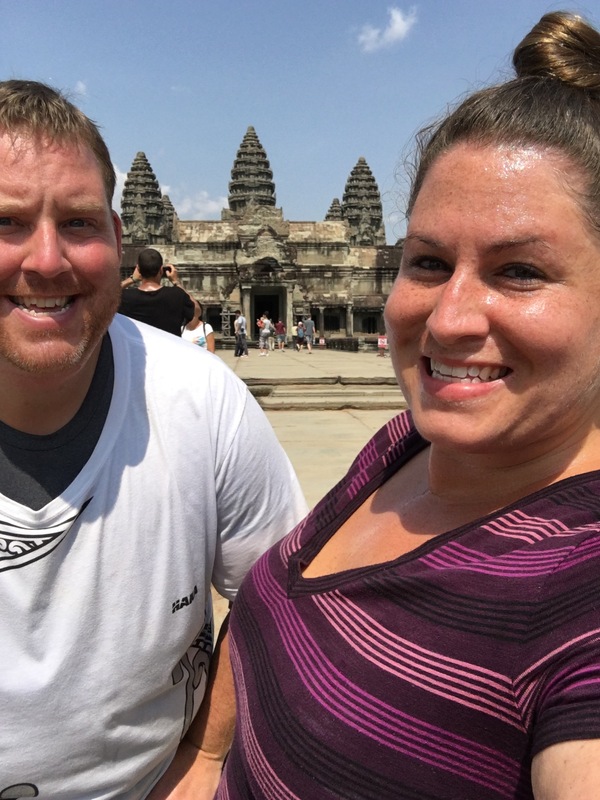 Since we’ve seen so many temples we decided to pick one that went to just the main temples, specIfically Angkor Wat, which is why we came here! We chose a private car since it wasn’t too much more than going with a group and then we were afforded the luxury of doing everything on our own time. For $40 we were picked up at 8:30am and had 8 hours to spend exploring. First we went to the brand new visitors center that opened in February, a massive beautiful new building next to a brand new, 1000 room hotel. What was once a destination that not many would travel to (in comparison to other places) is slowly becoming a major destination. 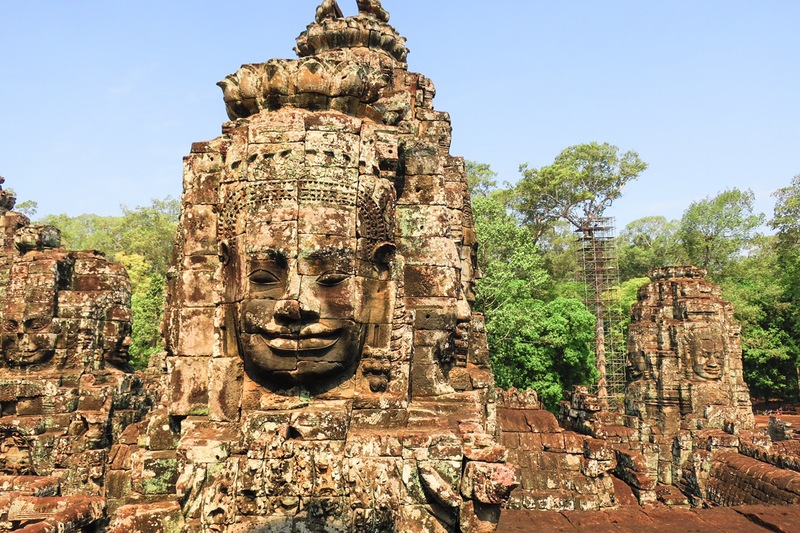 According to our driver, the tourists that come to Cambodia are 70% from Asia, mostly Chinese and Korean, the remaining 30% are “westerners”, encompassing the Americas and Europe, he didn’t mention Africa but we saw a group from Guinea. 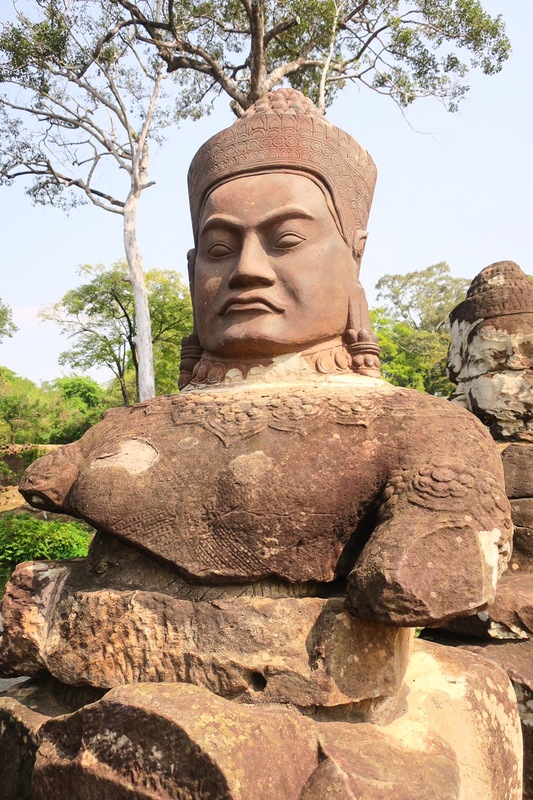 So needless to say, we The Cambodian people were very nice but made it known that they were quite impressed with our size, both height and rotundness. We got a lot of looks, stares, pokes and pats on our tummies. After getting our picture on our visitors pass for “only” $37USD per person (it used to be only $20, but you’ve got to pay for that shiny new visitors center somehow right?!) we were off! After a stop in at the old visitors center for one of the many “ticket please sir” (everything was sir.. I was rarely addressed!) 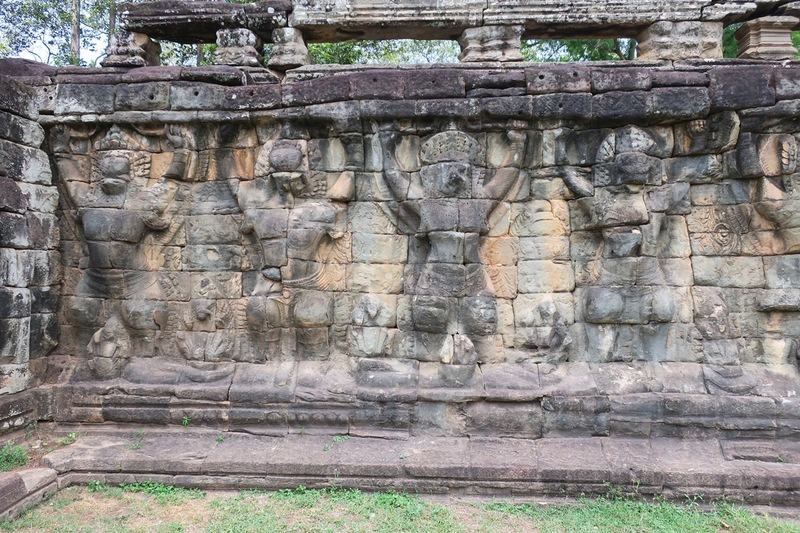 stops we got to see the old city of Angkor Thom, only a few kilometers away from Siem Reap. First we stopped at the city gates, plundered after the many conflicts that scared the region, but still standing tall. 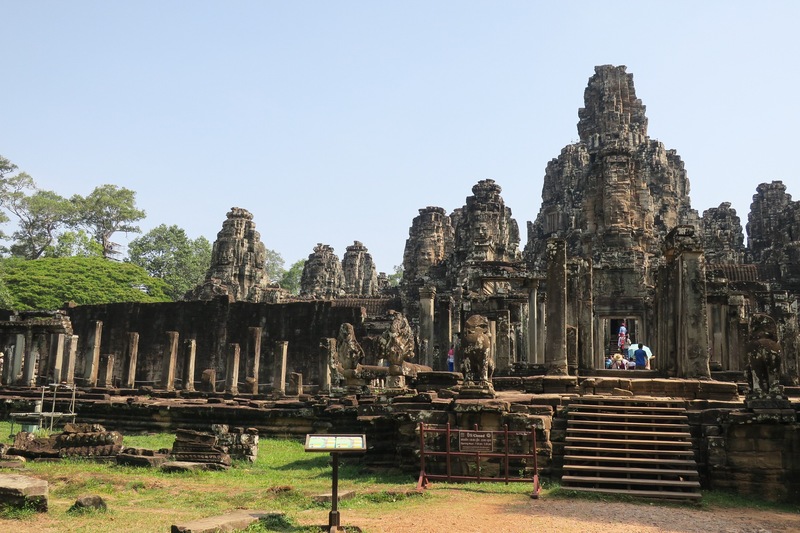 Inside the old city was The Bayon Temple which was once the state temple for the Buddhist king. 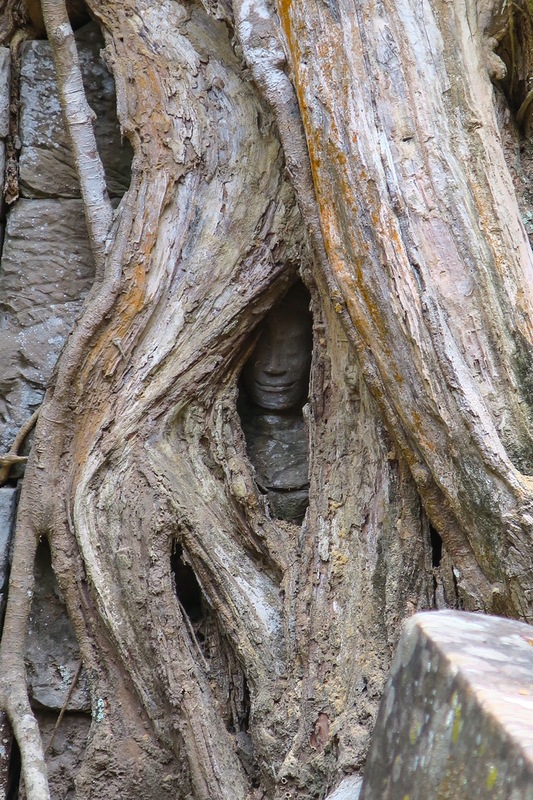 What makes it unique from other temples is that it is hundreds of Buddhist faces everywhere! Some small, some big. Some more weathered and some more pristine. It’s as if they were all smiling down on us with happiness that we were there to visit them. 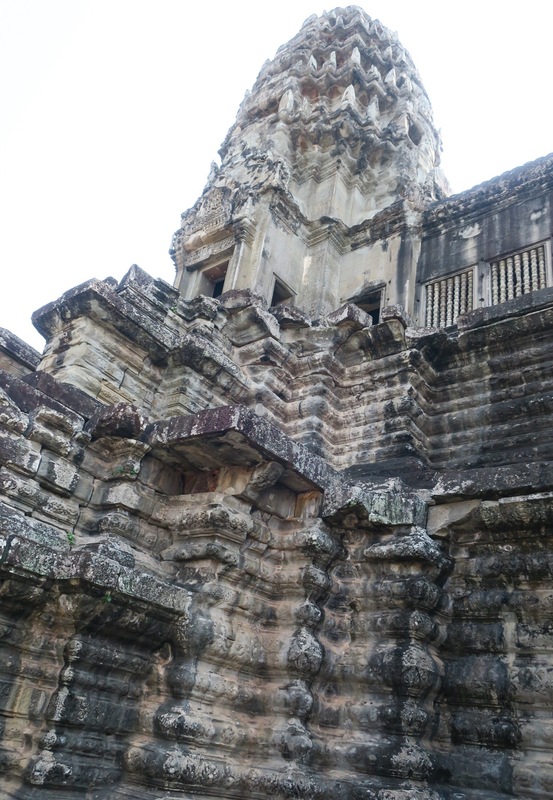 Next up was the Royal Palace or, Phimeanakas. 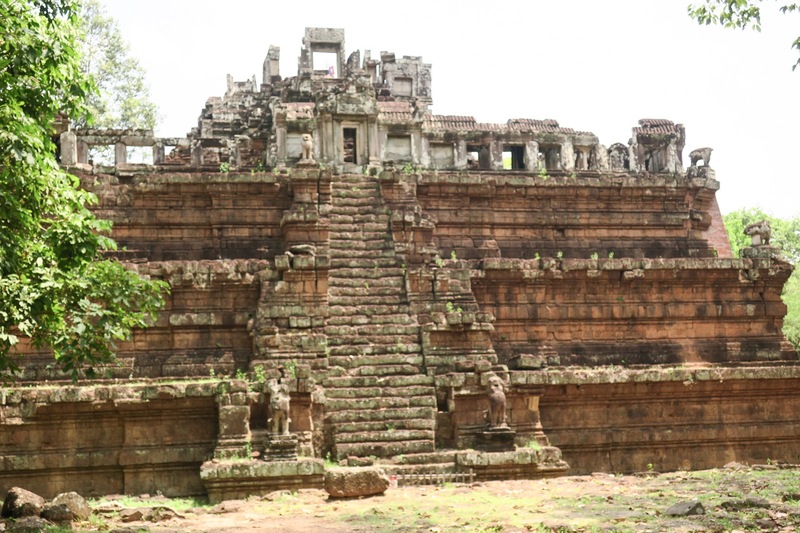 There was a very long elevated walkway that lead to entrance where you could see a stunning three tiered pyramid temple greeting you. 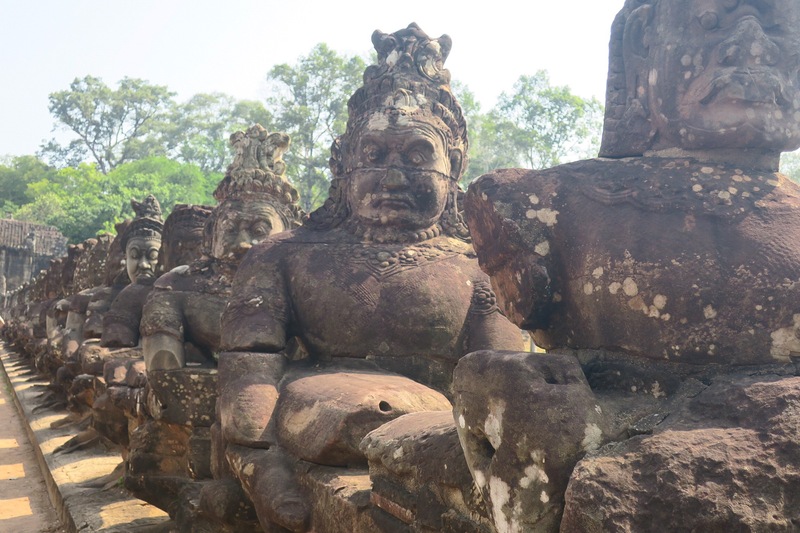 Again, many Buddha faces smiled as you walked around and awed at all the impressive stonework and carvings throughout. 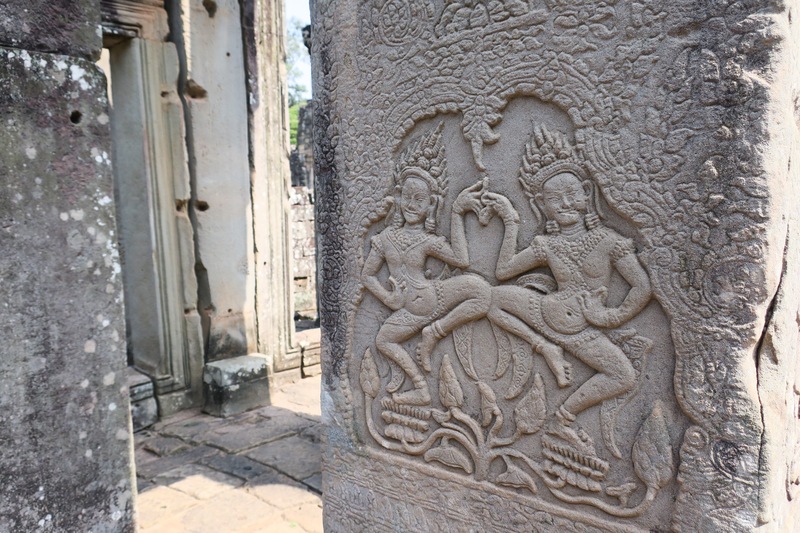 We found ourselves wondering what stories these carvings told. 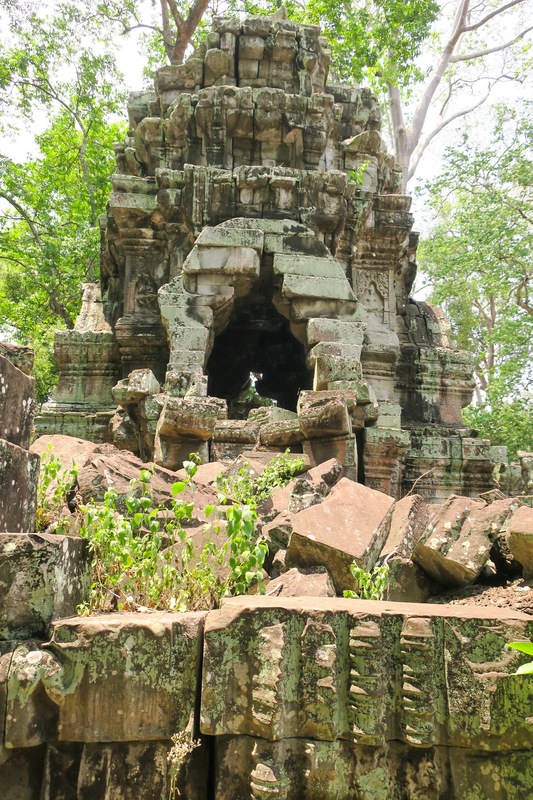 Dean decided to give his knees a workout and climb around and up the temple while I took a break in one of the rare shady spots out of the horrifically hot sun. 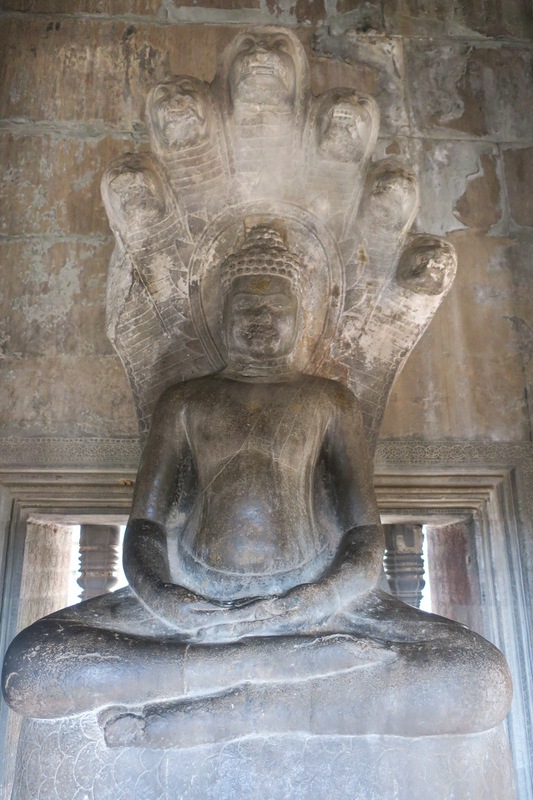 So many great views and carvings inside along with some Buddha statues. Apparently there wasn’t a clear way to get back to me, so Dean ended up trekking through a bit of woods to double back. If only we knew there was only one way out! We then walked along the terrace of elephants. 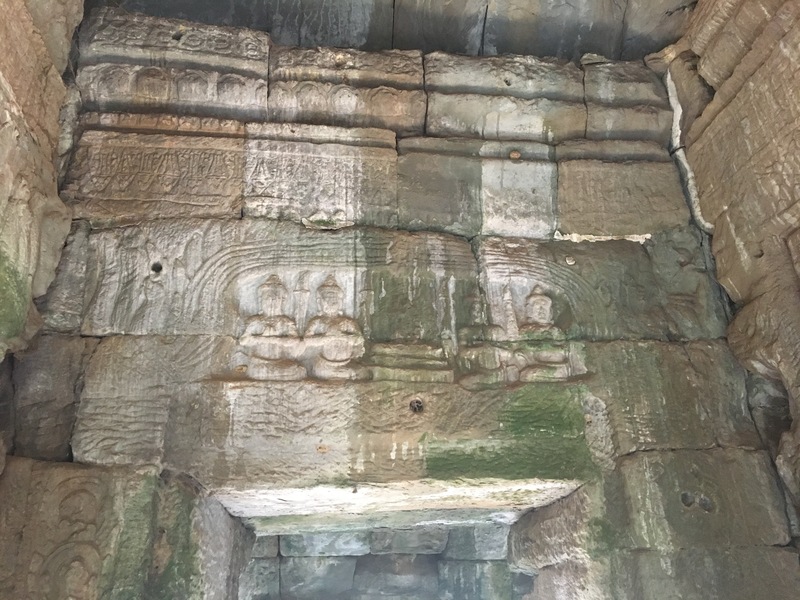 Another elevated walkway with carving of elephants and even stone reliefs of elephant trunks. 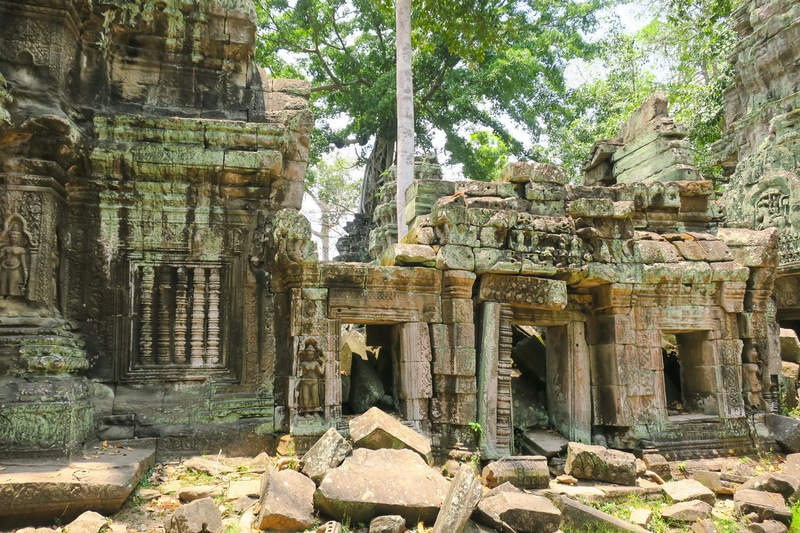 There was also a terrace of the leper king, that one didn’t seem as impressive, maybe because he got leprosy from cutting off a snake’s head, but I guess we’ll never know. Back into the nicely air conditioned car and our overly warm bodies were off to the next site. 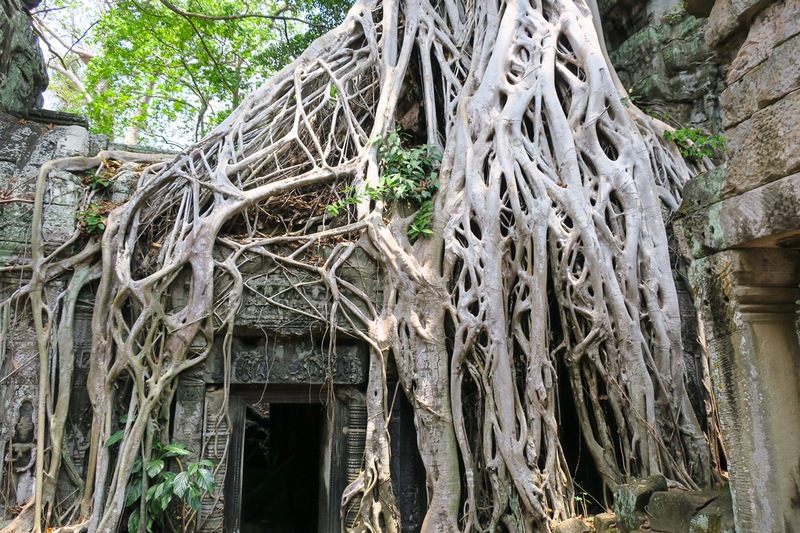 Just outside the old Angkor City was Ta Prohm, better known as the “Tomb Raider” temple as that is where the movie was filmed. 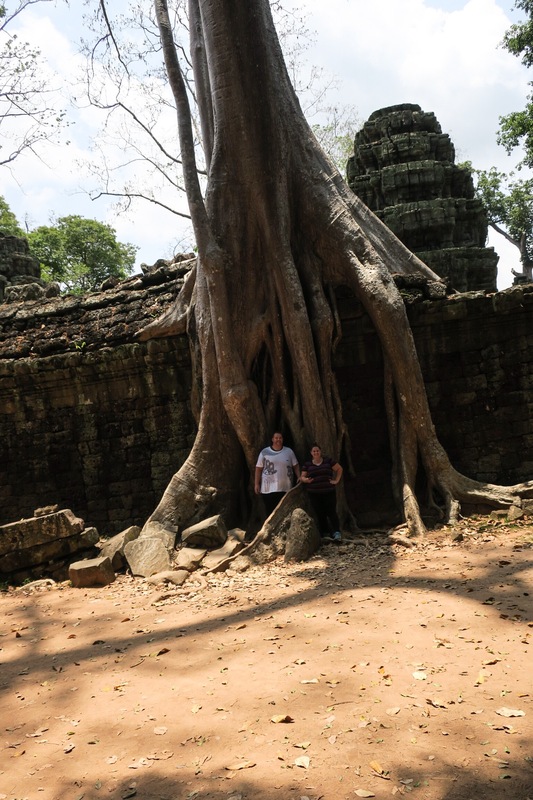 Neither of us ever saw the movie, so we didn’t get the excitement but it was clear that this was a very proud thing for the Cambodians. Our driver went on and on about how Angelina Jolie was here filming it and how she just recently was here filming another movie as well. This temple was by far our favorite and most impressive. 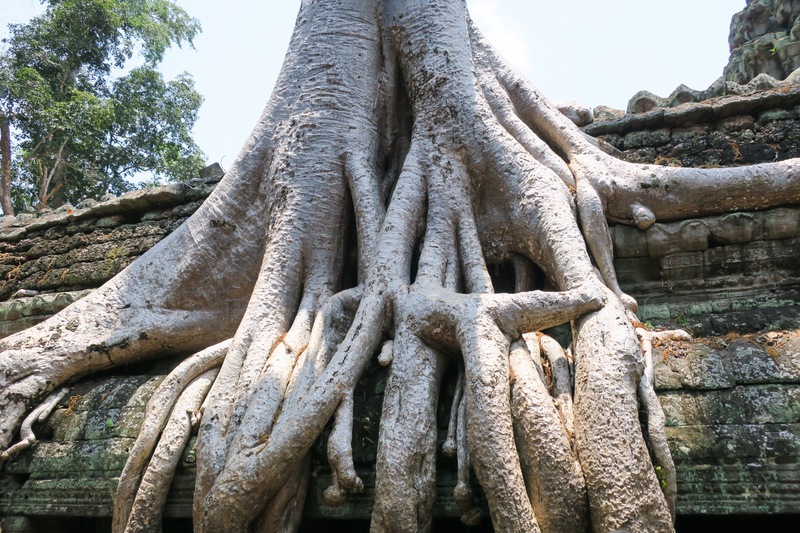 Not only did it have the intricate carvings and statues but this temple had trees that grew in and around the temple walls over hundreds of years. 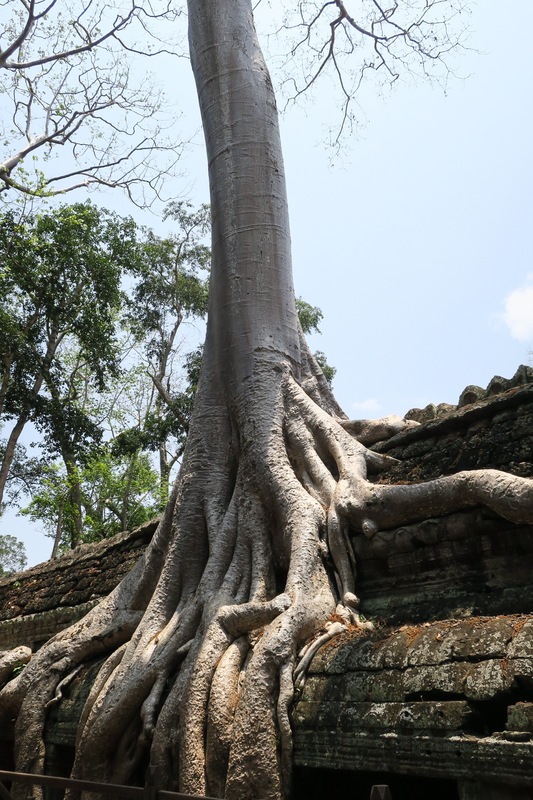 We learned that, long ago, birds would eat fruits in this area and would drop the seeds as they were eating, those seeds dropped into the temple and fed it with nutrients to start growing these enormous trees. 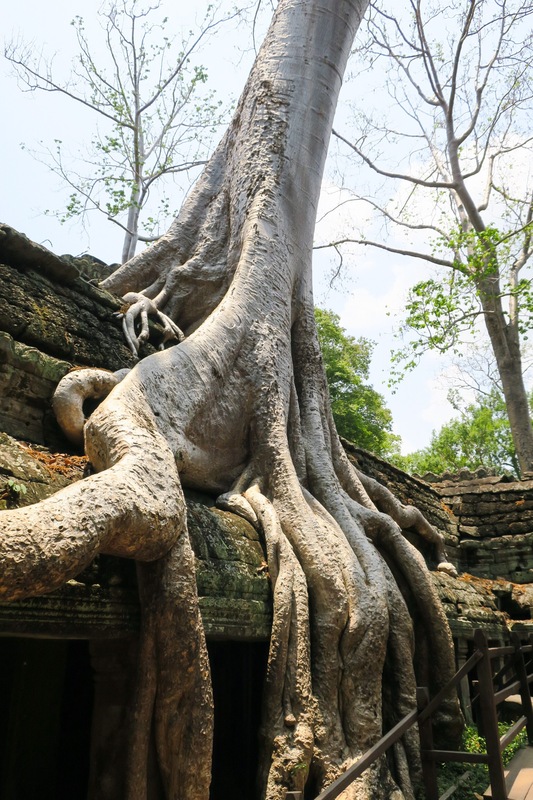 The roots have since encased and overcome the walls. It’s an absolutely breathtaking sight and puts everything into perspective about how old and how much history was lying right at our feet. 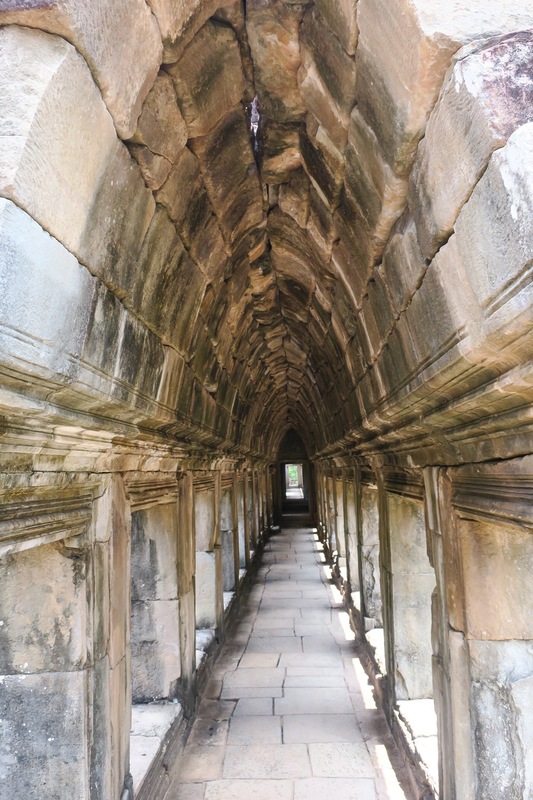 We spent a good amount of time exploring here, so many great corridors to explore! We got some awesome pictures, but nothing compare to seeing it all in person… it was just mind blowing! 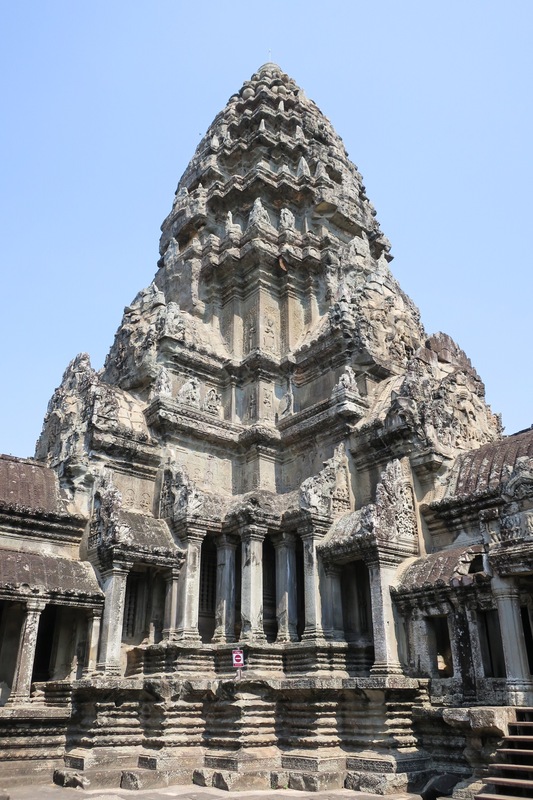 The last temple was the one we’d been waiting for, Angkor Wat, the largest religious monument in the world. 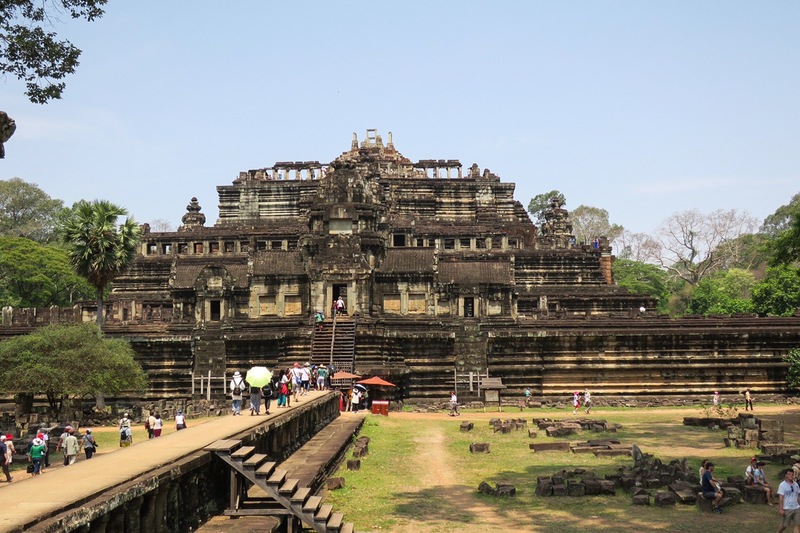 It was once a Hindu temple but has since transformed into Buddhist. 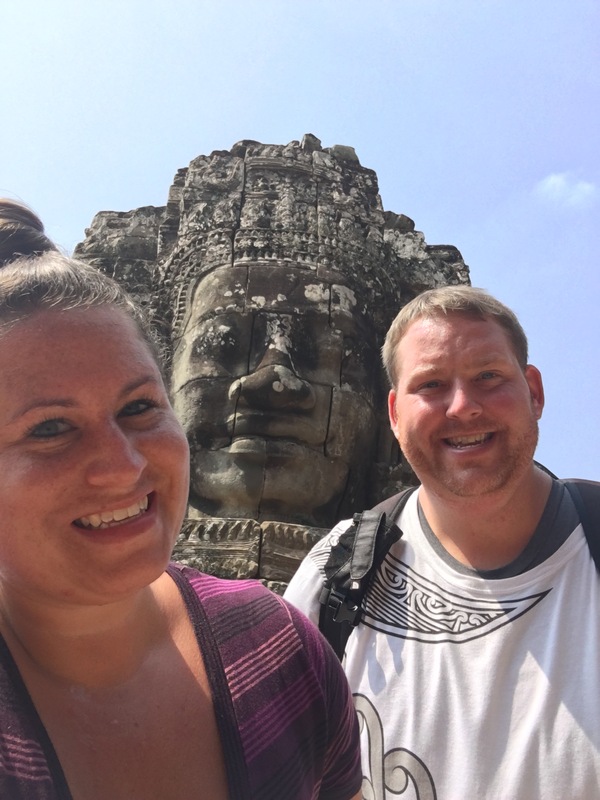 Angkor Wat has been on Deans bucket list for years! Believe it or not, ever since he saw that Expedia commercial with the old guy climbing the steep stairs at sunrise, he knew this was a place he had to visit. They save this temple for last on the tour because of the way the sun hits it. In the morning the sun casts a shadow on it so it’s hard to photograph, but the afternoon it hits just right and is perfectly clear. 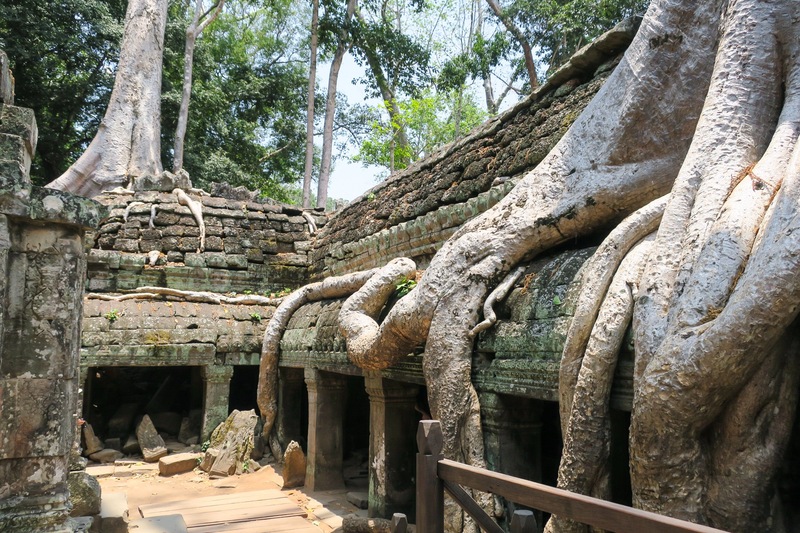 The bad thing about going in the afternoon, in our opinion, is that by the time you get there you’ve been running around temples for 6 hours and are extremely sweaty, hot and tired. We hopped out of our nicely cooled air conditioned car and into the heat and mid-day sun. The walk from where the cars drop you off to the entrance feels like someone has stuck you in a sauna with a tanning booth light shining on your head with all your clothes on and turned it all the way up. Sweat is dripping from areas we care not to mention and our clothes look like we’ve just jumped in and out of the pool… boy did we wish that was actually the case. 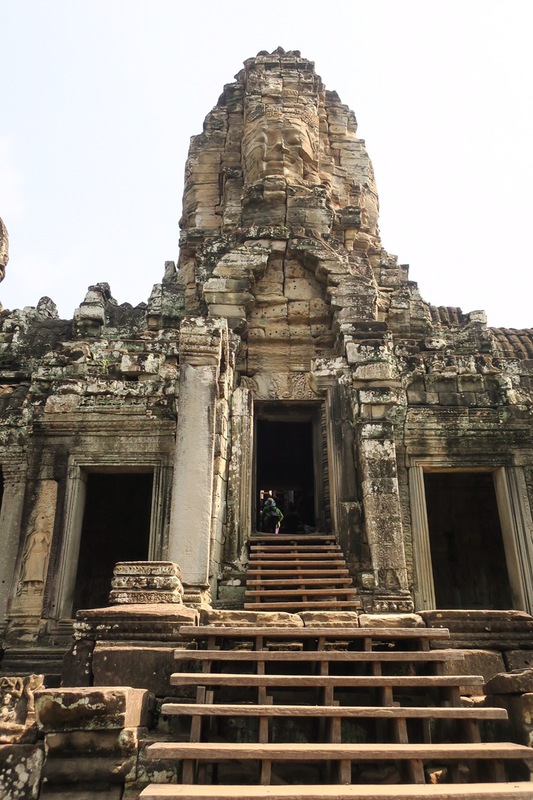 Angkor Wat was incredible. 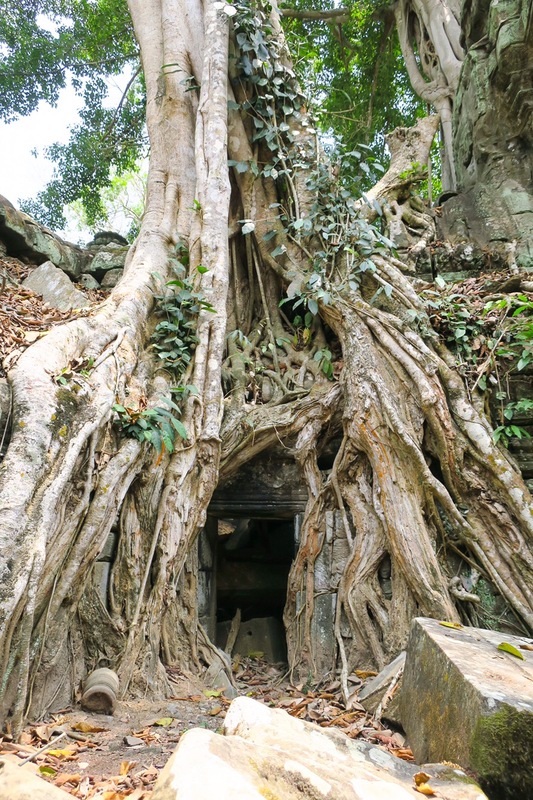 A site built so long ago with immense meaning and character. Each stone tells its own story and it’s been telling it for hundreds of years. However, was it just like what we built up in our heads? No. 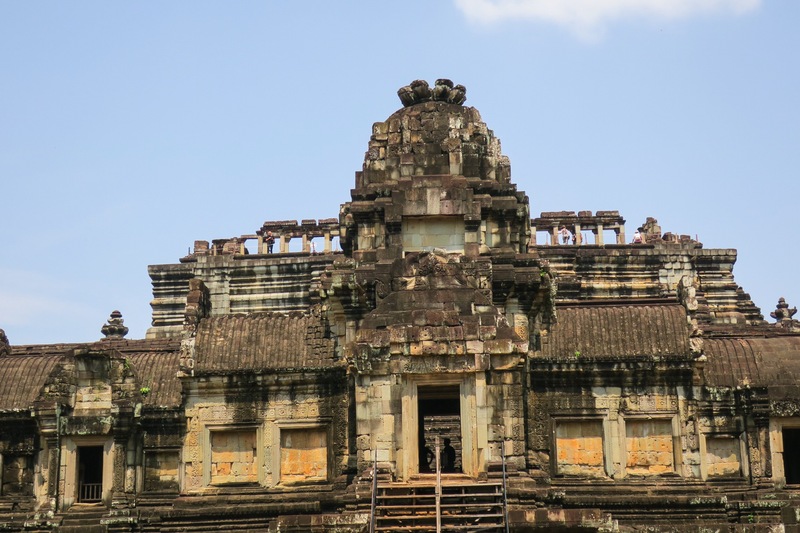 If this was the first temple you’ve ever visited then maybe you’d disagree, but we just felt a little underwhelmed here. 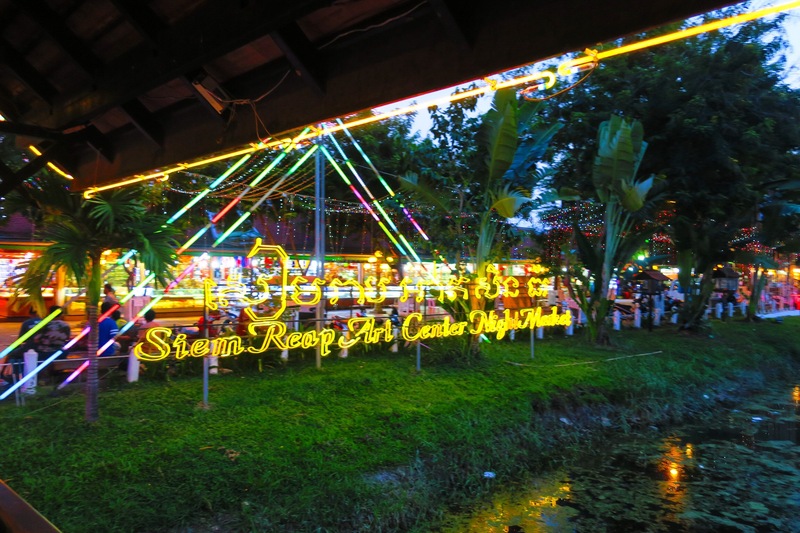 (We know it sounds bad, but as the Thai people say it’s “same same but different”) It was nice to walk the grounds, hundreds of monks come here as a holy shrine, but there was also people selling pictures, palm drinks, postcards and so on. Kinda deflating! Dean again scaled the temple (using the newly installed stairs, no more climbing the original rock stairs) to the top. 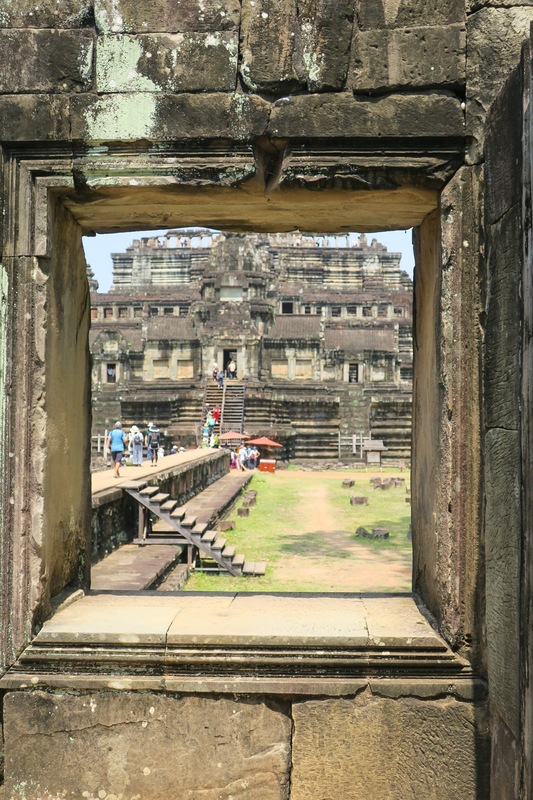 Great views, but it was hard to get the classic view of the whole temple, the view that embossed the flag of Cambodia, the outline you wait forever to see and it’s obstructed by hundreds of tourists, palm trees and people trying to sell you a picture of yourself. It was amazing to get there but not so amazing to actually be there. 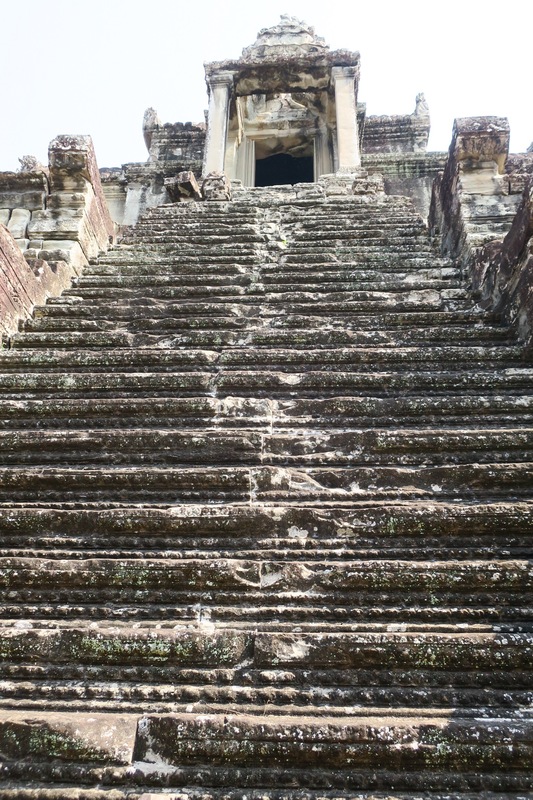 We honestly think, if it’s in your bucket list, do it, but don’t be like Dean and think it will be like that Expedia commercial where you’re the only one there climbing centuries old steps. 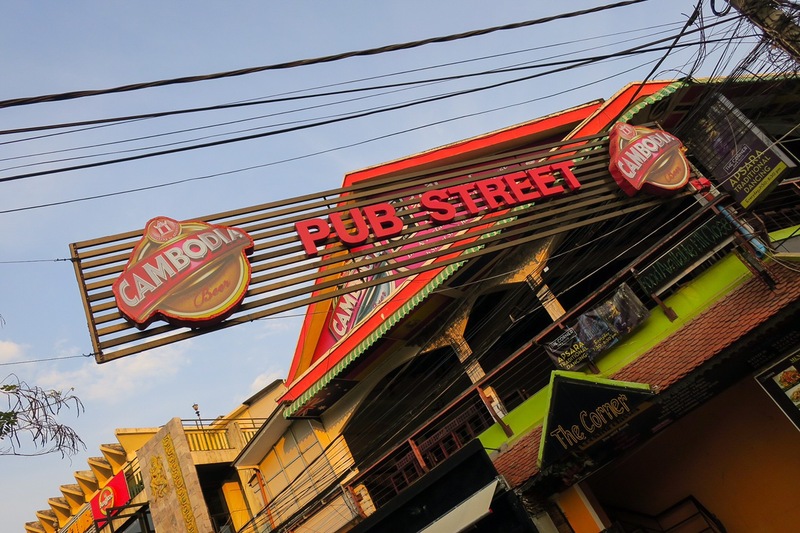 The Food: Aside from a restaurant during our temple hopping, Pub Street housed our entertainment and meals both nights and our last day in Siem Rep. 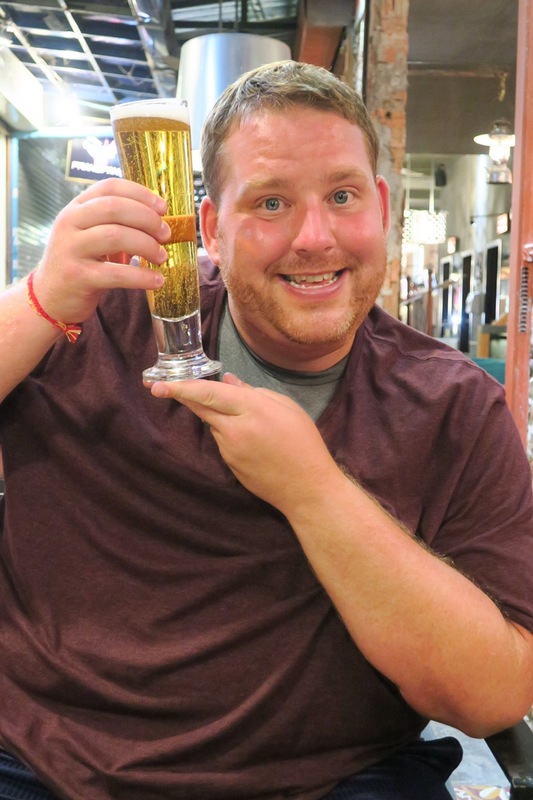 Pretty much every restaurant had $.50 beers all the time… so of course we loved it there! 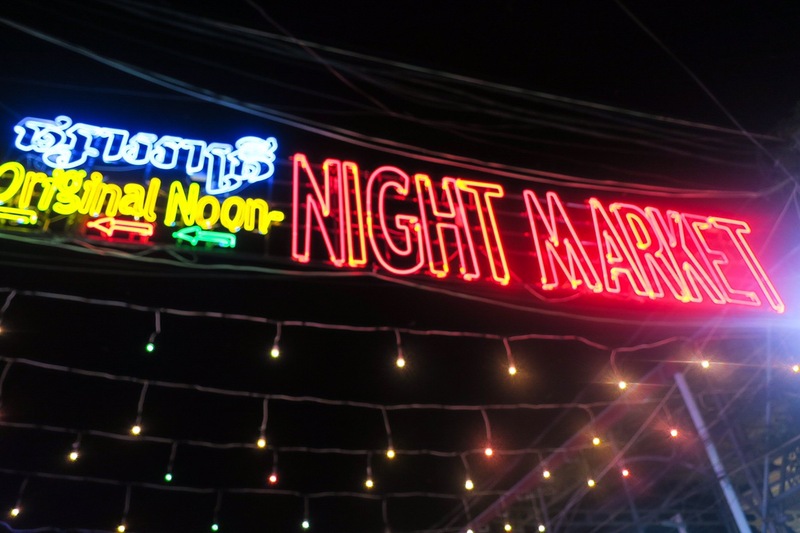 It was interesting because it definitely was the nightlife of the city with bright lights, loud music and lots of people but it felt a million miles away from how Patong felt. There wasn’t people shoving their menu in your face or begging you to come into their shop, it was just everyone doing their thing and having fun and if you want to join, great! 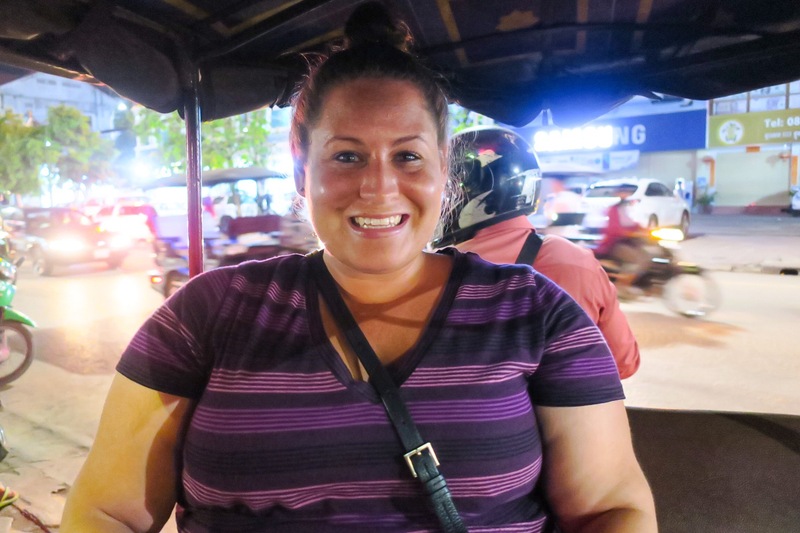 The only bit of forcefulness we felt was from the tuk tuk drivers and massage places. Of course we had to indulge in those while we were there! 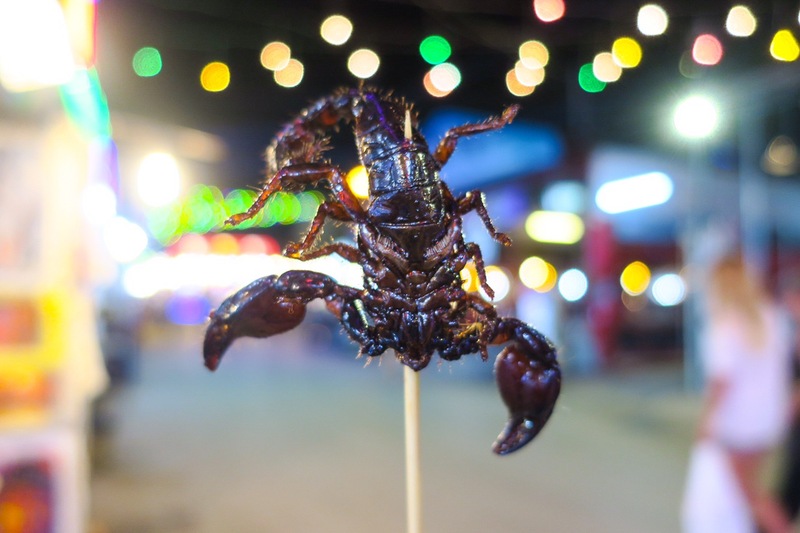 Dean enjoyed a scorpion here… he’s clearly on a bug eating kick! 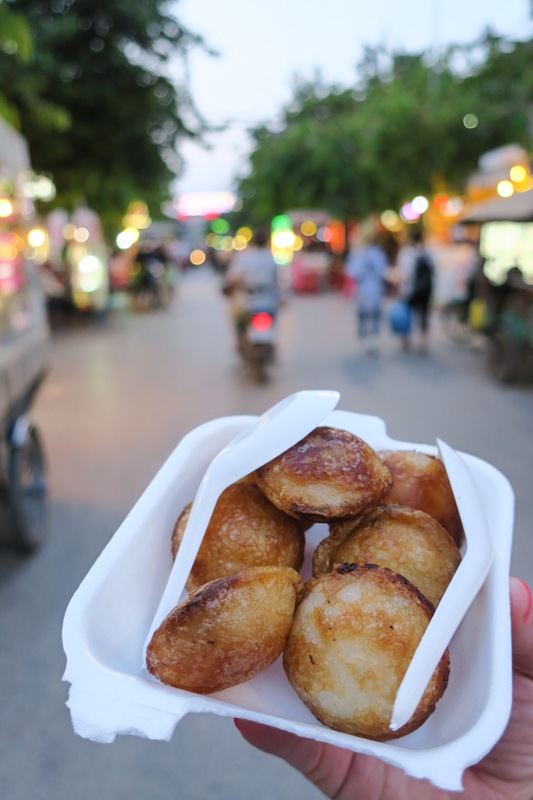 We also enjoyed some delicious street food consisting of Coconut Rice Cakes with different fillings, they were like pockets of sweetness that popped open in your mouth with a surprise as to which filling would be inside, either corn, banana or mushrooms! Random Tourist Place: After a long morning of exploration in the hot hot hot sun of Cambodia, we stopped for a bite to eat. The bad thing about booking a tour that doesn’t have lunch provided for you is that you’re at the mercy of your driver. 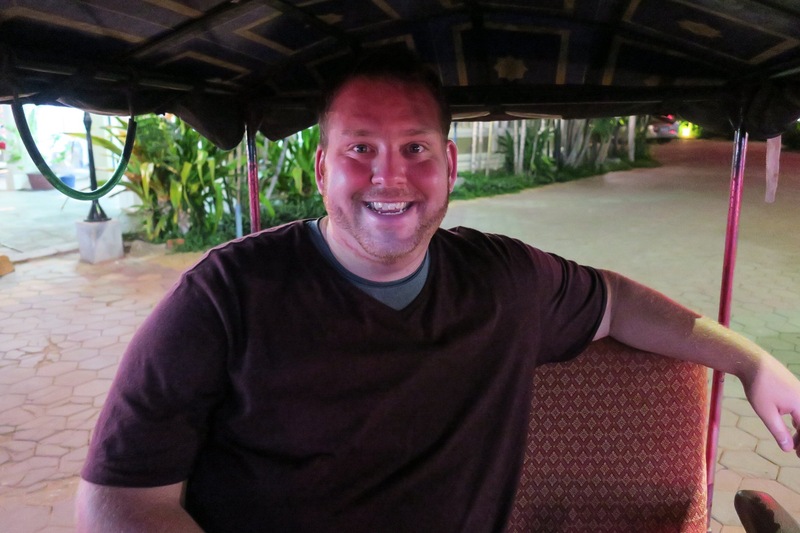 We told him we wanted authentic Khmer food and he took us to a place he knew. (We never got the name!) 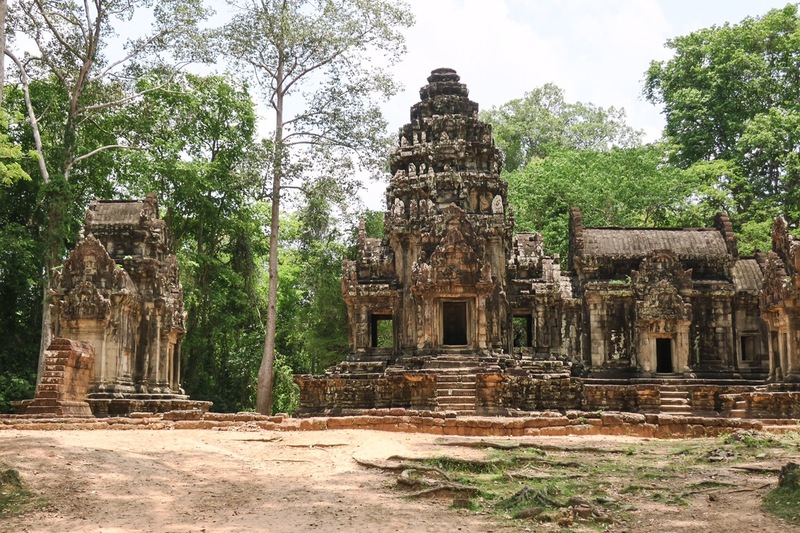 Of course it was right across from “the King’s swimming pool”, which was more like a lake, but it was lined with spots that were for tourists, many Westerners lounging on hammocks under trees taking a well deserved nap after a hard morning of temple exploring. This, combined with the fact that you’re not near town led to high prices (for Cambodia). Despite all of that, the food was great for an intro into Khmer cuisine. 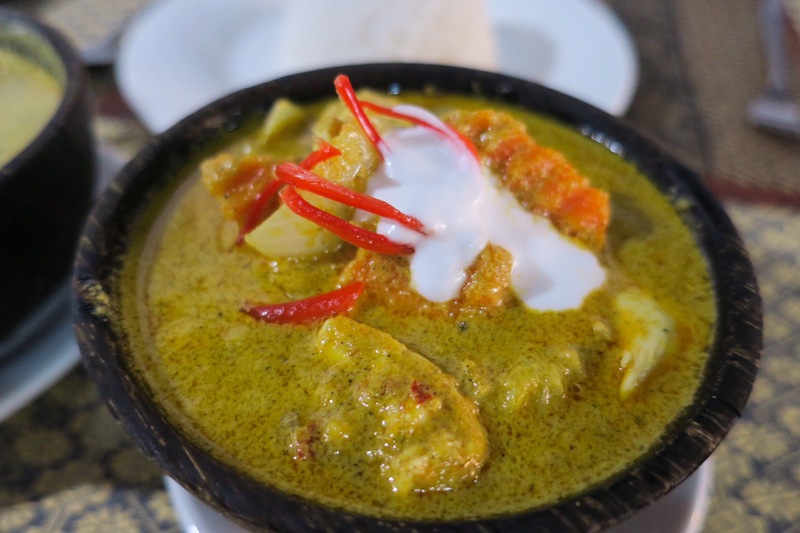 We got the traditional Khmer foods of chicken Amok (traditionally served with chicken or river fish) and Khmer Curry. 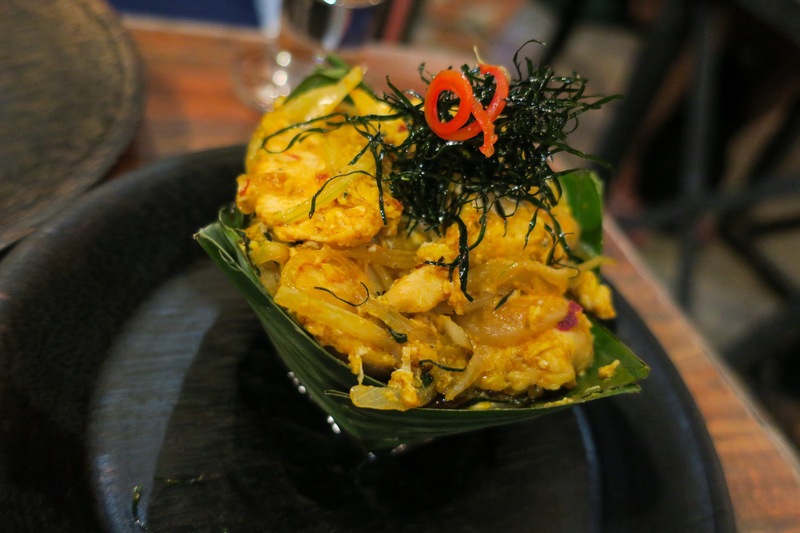 The name Amok refers to the method of cooking in a banana leaf and it is traditionally served that way, however, this one was not. 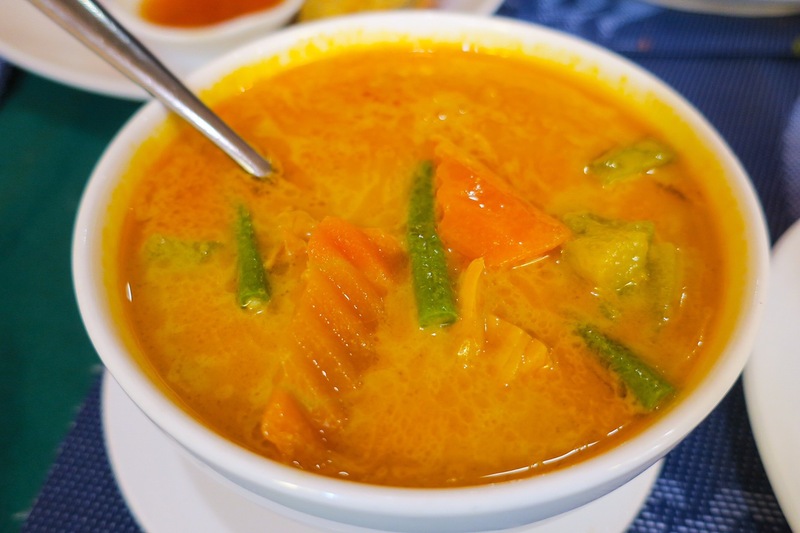 It resembled a curry soup dish with chicken, a mix of Thai and warming spices and chunks of vegetables in a yellow coconut based broth. While it was incredibly delicious, it wasn’t exactly what we were expecting. The curry that we ordered was actually pretty close to the same thing, just with a few different spices and a touch thicker in texture, which is funny because it was supposed to be the reverse! 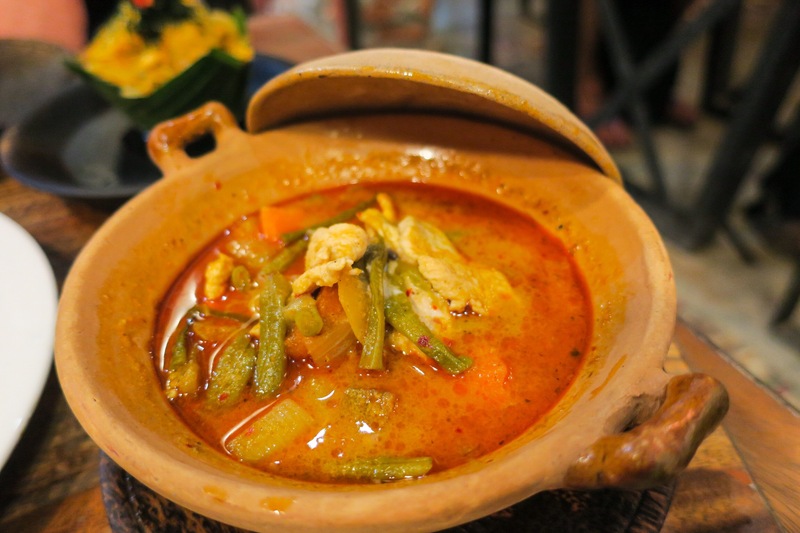 Chicken and vegetables in a red curry and coconut broth. Both dishes had that sweetness from the coconut and excitement from the spices. We ended up spending $20 for the two dishes. We were happy with our meals but considering they’re less than half the price elsewhere, we were a tad disappointed when finished. Khmer Family Restauarant: After a long day of exploring we were hungry for a big Khmer feast. 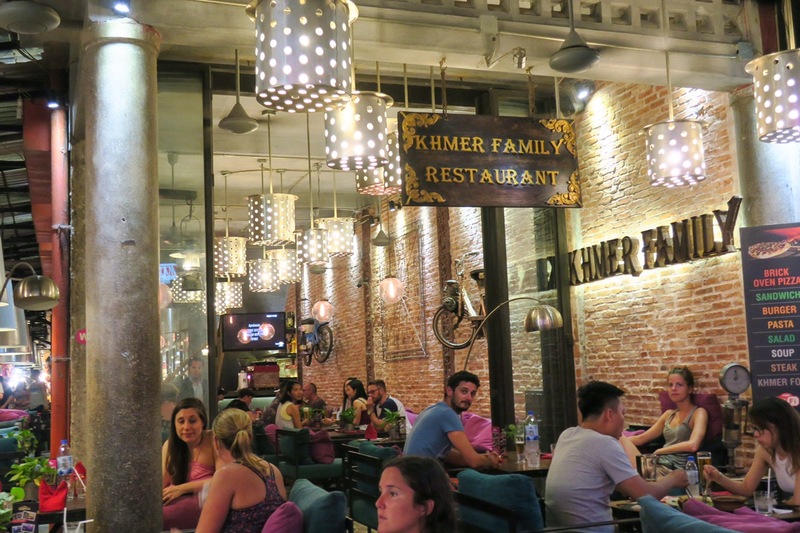 We chose Khmer Family because of its comfy looking chairs, enticing menu and because we wanted another go at the foods of this beautiful country. Since we were starving and had such a long day we felt we deserved to go all out and get a few different dishes so we could try more the popular Khmer Cuisine. To start we shared a banana flower salad with chicken. 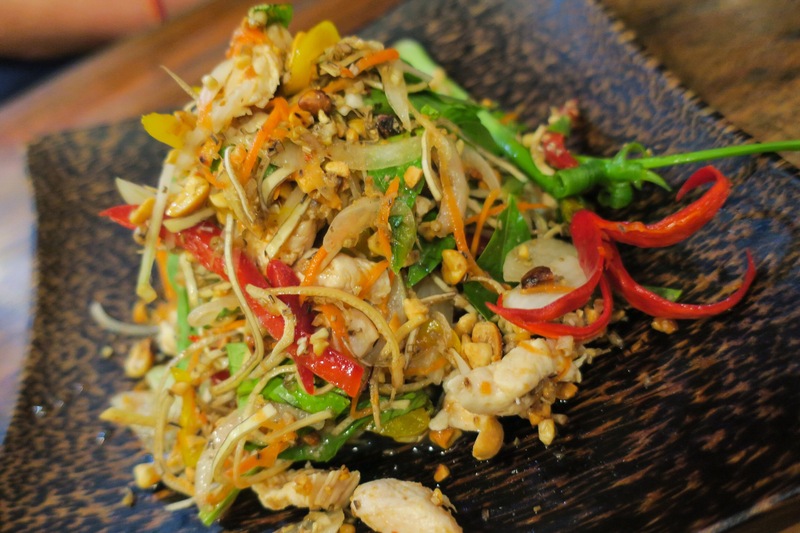 Shredded banana flower with carrots, peppers and chicken in a tangy but sweet and slightly spicy sauce. This cold salad was the perfect thing for such a warm night! 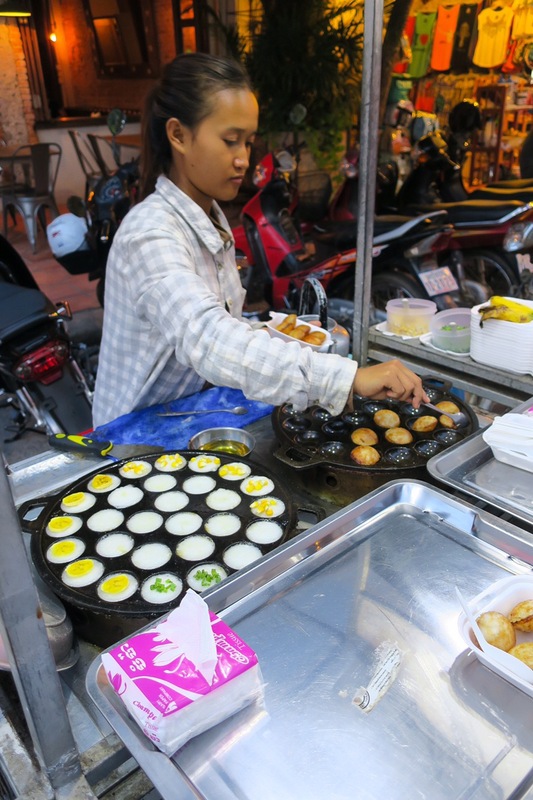 It was similar to the green mango or papaya salad in Thailand. 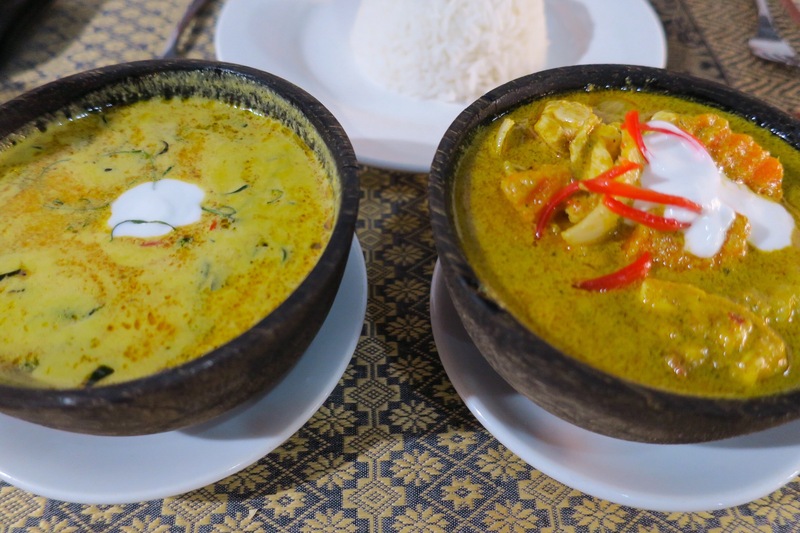 We also wanted to sample the Amok and Curry so we could compare it with our lunch and also an ordered a plate of Lemongrass chicken. 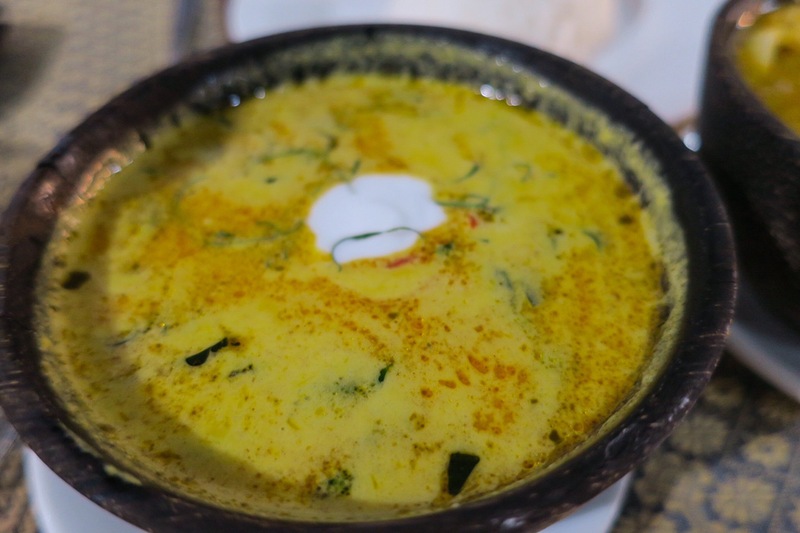 All the dishes were amazing, the Amok was much thicker here and served in a banana leaf, just as it should be. 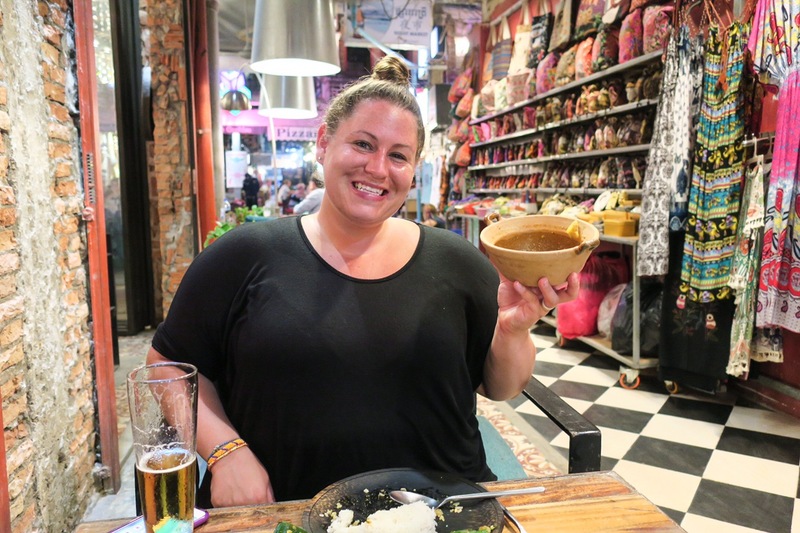 The Khmer Curry was the same brothy style as at lunch, but this time we (Dean) tried it with pork, so the inherent sweetness of the pork made the sweet broth taste that much better. I couldn’t get enough of it! 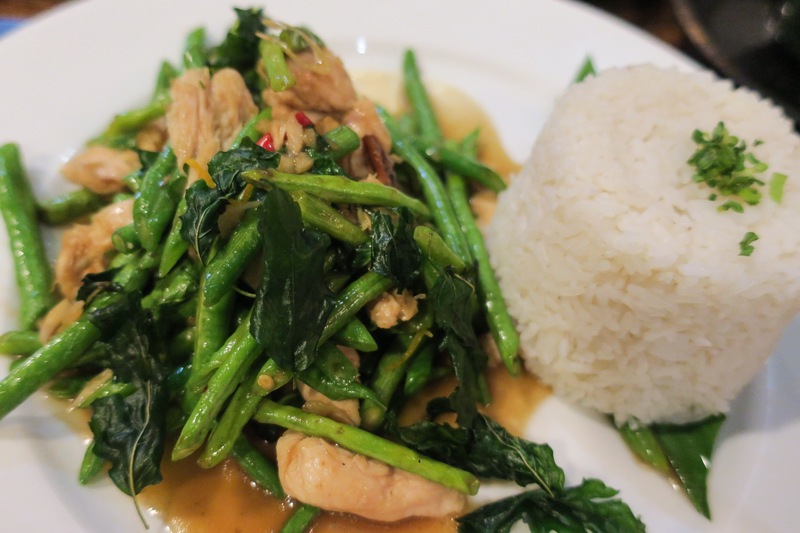 The Lemongrass chicken was amazing, a giant plate of stir fried chicken intertwined with fresh barely streamed green beans, fried garlic slices and an occasional pop of flavor when you bit into a piece of lemongrass. 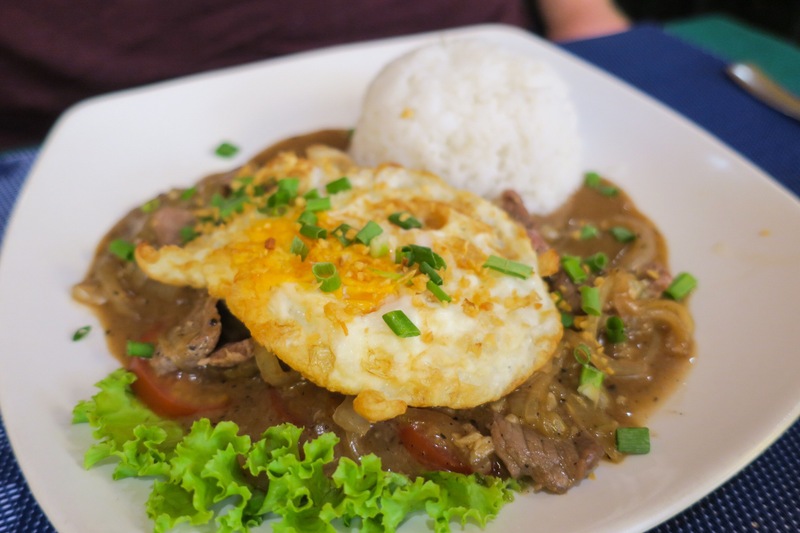 Pair this with more of those ice cold 50 cent beers and you can call this our best meal in our (short) time in Cambodia. 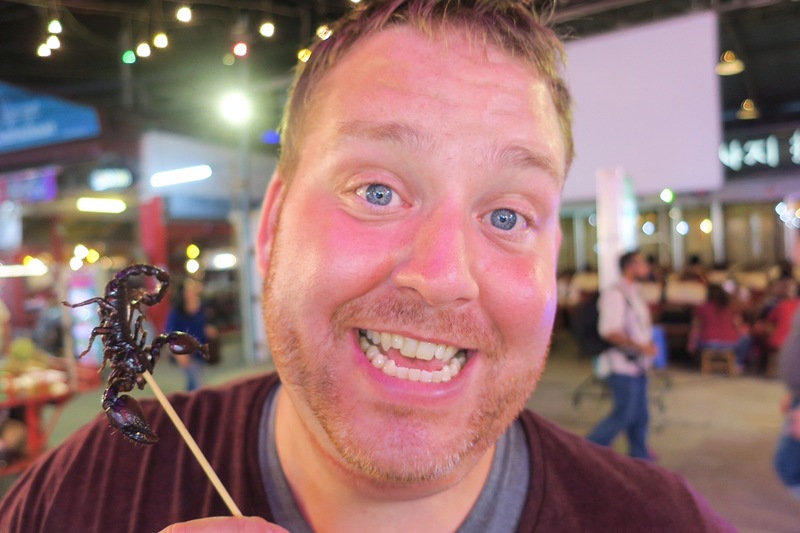 Smiling Food: We started out on a mission on our last day, Dean wanted Crocodile pizza…what? So we walked the streets only to find the seemingly endless supply of crocodile pizzerias we thought we had previously seen were no where to be found. 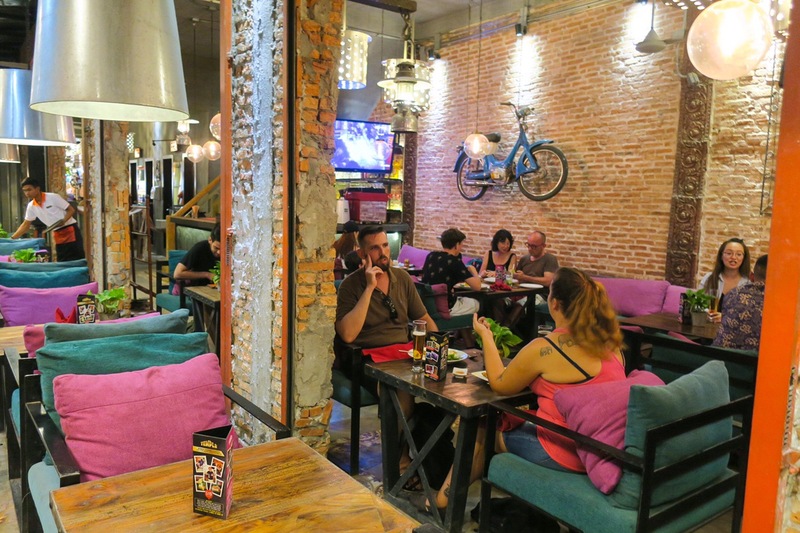 We traipsed up and down pub street, dodging the restaurant with the blaringly loud live singer that was a Cambodian style Miley Cyrus and ducked down an alleyway to find Smiling Food cafe. The cheap beer and sign stating Wifi @ (they meant &) peanuts and the beautiful we accept MasterCard logo made us stop. We thought we were Khmered out, but it turns out we found that we loved it and had more. I tried a third iteration of Khmer Curry, just to see if it was any better. Sadly it was not so good. I was expecting the sweetness to hit me just as the other two had, but unfortunately the only flavor that did that was that of fish… no thank you! Dean was more impressed with his dish, he got Beef Lok Lak, a throwback to French imperialism just lightened up for the heat of the jungle. Thinly sliced beef sautéed with onions and slices of tomato in a beefy Espagniole (brown) sauce with heaps of freshly cracked black pepper liberally sprinkled throughout. 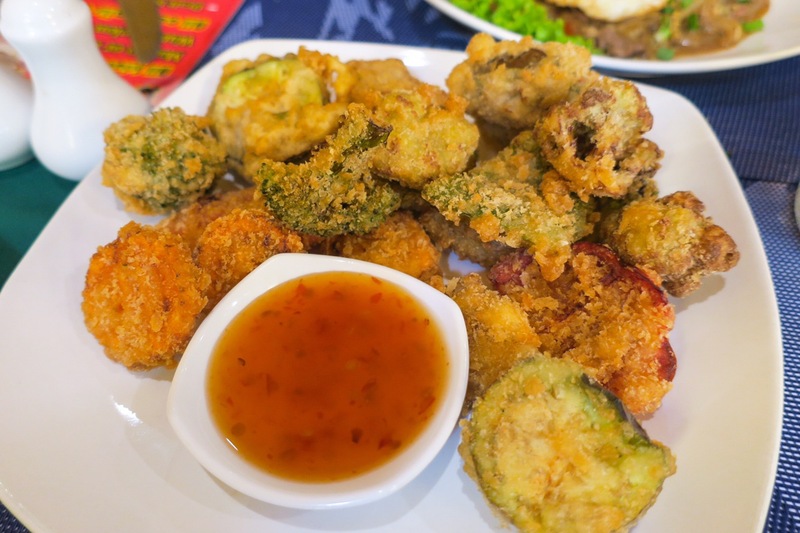 We also ordered a plate of tempura veggies, the Khmer cuisine isn’t known for its tempura, and it shows why.. more like just breaded with some sort of weird coating and fried. Blah. Overall only Dean had a nice main course which is why we even mention this place! It’s always fun to pop into random alleys and discover hole in the wall places. 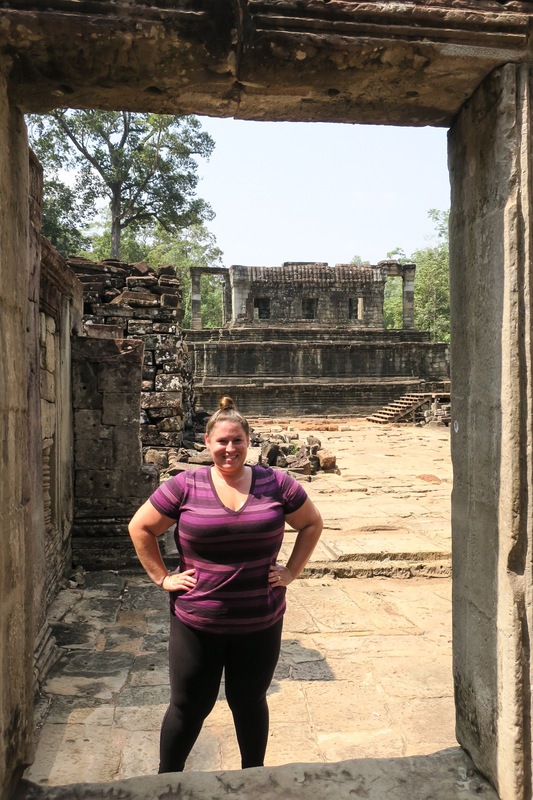 We were so incredibly impressed with Cambodia! A place we’ll definitely need to come back and explore more of! 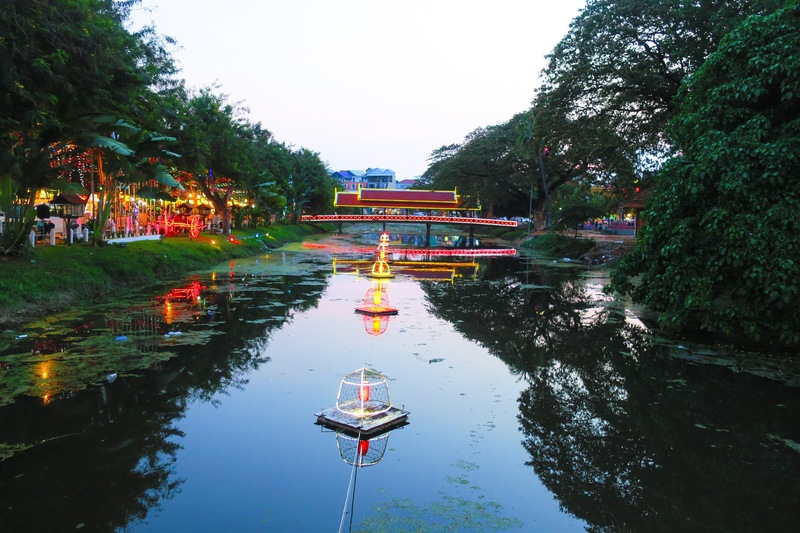 For now… off to Vietnam! See you in the land of Bahn Mi’s and delicious coffee! 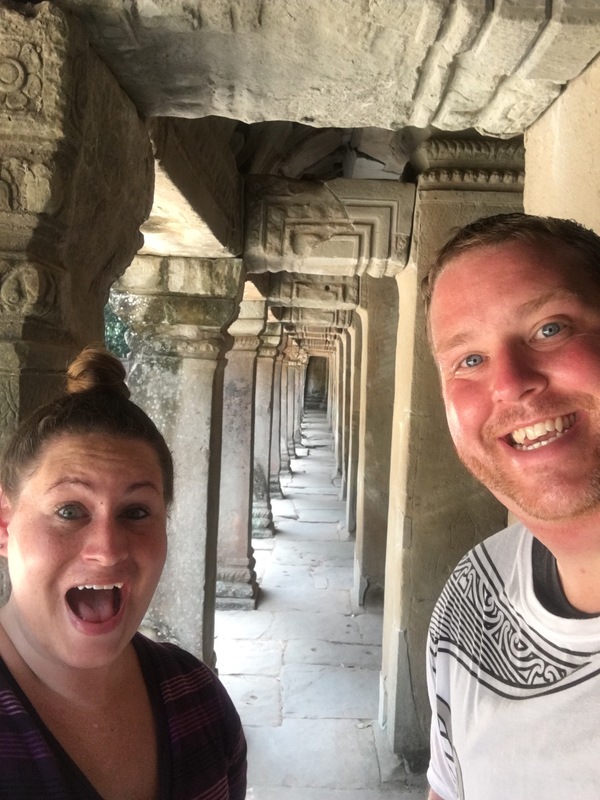 You two are so fun and I really look forward to reading what you are up to and where you will share with us next/ Yes, I too would have thought differently of Cambodia so nice to know first hand so to speak and you have no idea how much I LOVE LOVE LOVE seeing all your photos!!! Thanks!!! Thanks for being such a loyal follower!! We love to hear your feedback. 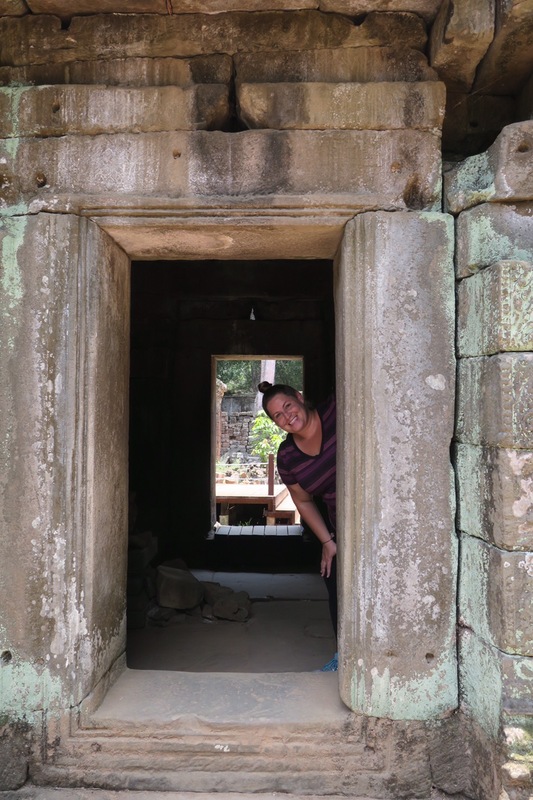 So glad you enjoyed the Cambodia post. We need to go back to explore more for sure!!! How beautiful those temples are! Do you know the name of the tour company you went with? Do you ever post reviews of that sort of thing (details) on TripAdvisor or similar? We just ordered a car through our hotel! We chose the “small circuit from 8:30a-4-30p that went to just those temples but you could choose one that went to more if you want. We’ll write reviews sometimes but more so on Yelp which doesn’t work here! 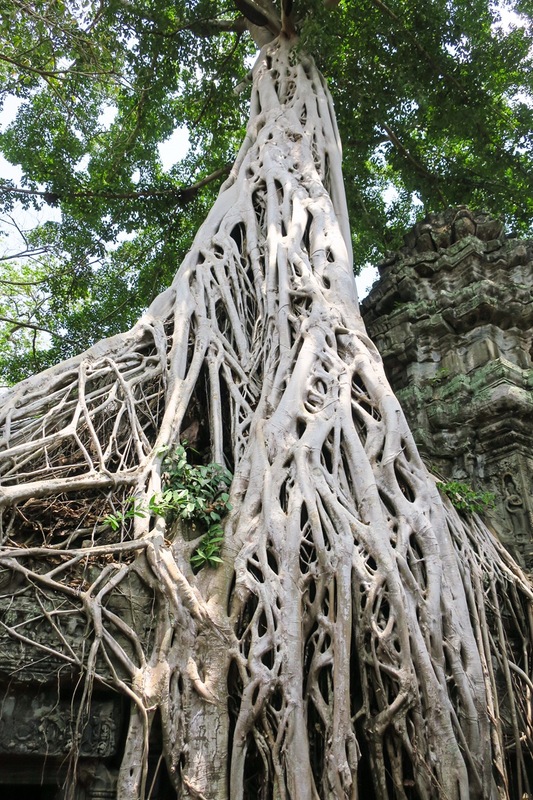 Ta Prohm was my favorite temple, too! What an amazing adventure. You guys make it look so relaxing strolling alone world wide. Thank you for sharing. Your photos are a delight & the descriptions of food are a treat of their own. Have the time of your life. Be safe. 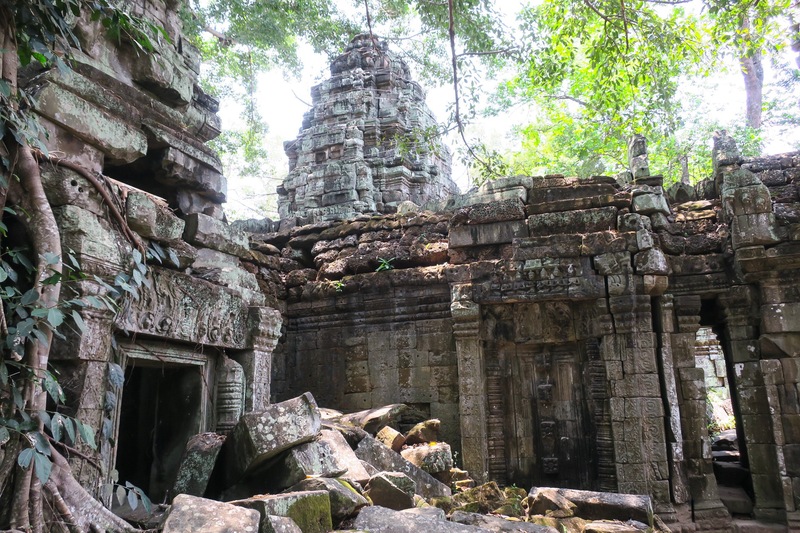 Soooooo amazing, the temples looked like puzzle pieces, at times. Dean how many beers did you have to drink before downing that scorpion? HAHAHA The food looked pretty enticing though.